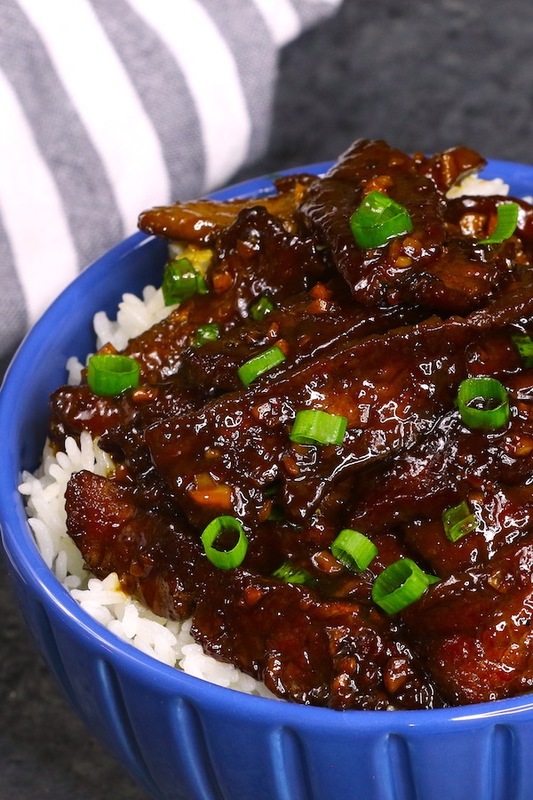 Mongolian Beef with tender and tender and juicy strips of beef smothered in an addictive sticky, slightly sweet and savory ginger garlic sauce, just like at P.F. Chang’s. All you need is a few simple ingredients and 20 minutes to make this restaurant favorite at home. Dried-out, overcooked beef happens to everyone every now and then. 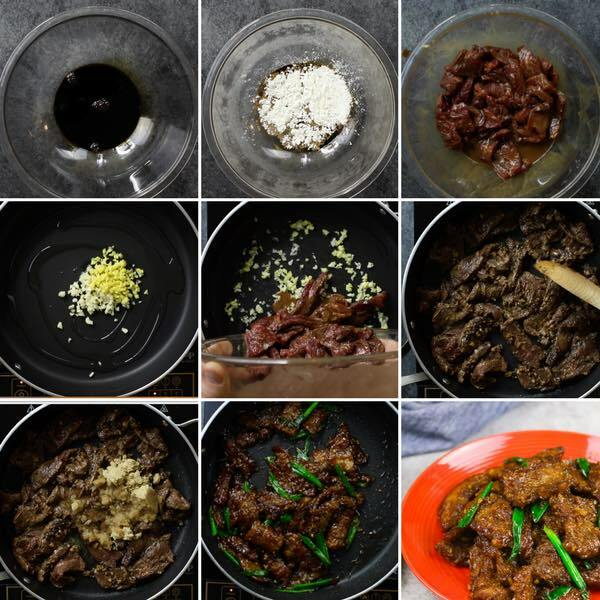 I will share with you some simple secrets for the tender and juicy Mongolian Beef. Just 3 easy rules: 1) select the right cuts; 2) Marinate with cornstarch + soy sauce; 3) Quick sear at high temperature. 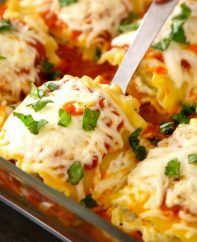 Amazingly easy for a quick weeknight meal with a few simple and basic pantry ingredients that you already have at home. With these 3 rules, P.F Chang’s restaurant-quality copycat Mongolian Beef can be easily made at home and is one of my family’s favorite dishes, along with Teriyaki Chicken, Garlic Beef Lo Mein, Honey Garlic Chicken, Chicken Pad Thai, Honey Garlic Shrimp, Turkey Meatballs and General Tso’s Chicken. The first secret to best Mongolian Beef is to get the right cut. AVOID the tough cut such as chuck beef. Try to get a high-quality steak. The best choices are tender beef cuts, including skirt steak, ribeye, top loin, tenderloin, flank steak, shoulder top blade, etc. Packages of pre-cut beef strips work well for this recipe too. If it’s not pre-cut, you need to slice them into thin pieces of meat. 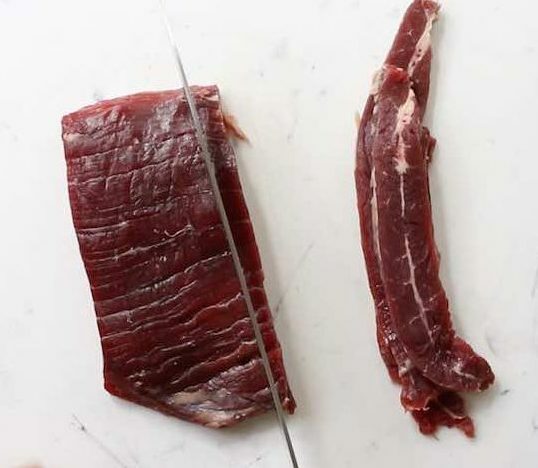 A great tip to cut thin strips is to place the beef in the freezer for 30 minutes, and this will firm up the meat so that it’s much easier to slice. It will also allow you to slice them into thinner pieces, just like P.F Chang’s Mongolian Beef. Note: Make sure the strips have uniform thickness and width so that they can be evenly cooked. 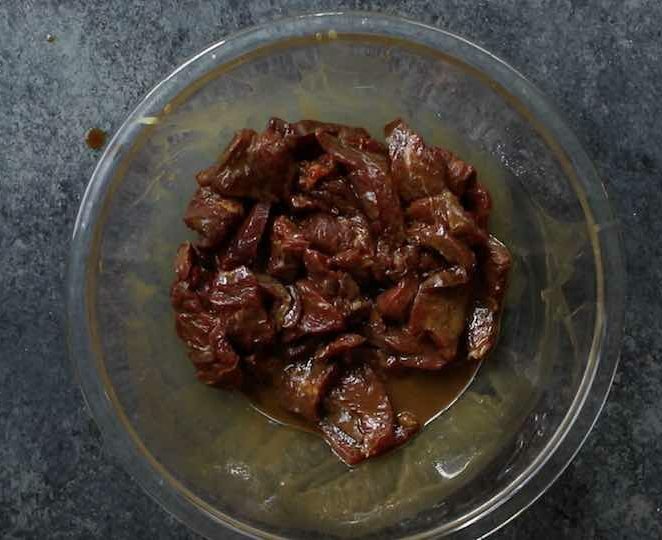 The second secret is to marinate the sliced beef in soy sauce and cornstarch for at least 10 minutes to tenderize, a process called “velveting”. Dipping the beef slices into cornstarch without marinating them will cause the beef to be very chewy. I highly recommend this step if you are not in a rush. It takes extra time, but it’s so worth it for a juicy restaurant-style result. 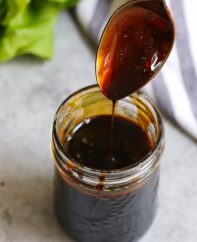 5-10 minutes of marinating make a huge difference. The third secret is to sear your beef at a high temperature (around 400°F) for a short time. Turn your heat to high after you add the oil and sauté garlic and ginger. When the skillet is very hot, add the beef, and quickly sear for about 1-2 minutes each side. This approach will yield the most tender and juicy beef. Slice the beef against the grain to a thickness of 1/8-1/4 inch. 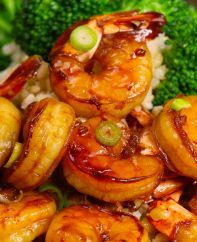 Then marinate them in soy sauce and cornstarch, ideally for about 30 minutes, but you can do it in 5-10 minutes if you are in a rush. Once your beef is marinating, you are halfway done in making this recipe. Place your skillet on medium-high heat, add the oil and fry the minced ginger and garlic for about 1 minute or until fragrant in a large frying pan. Turn the heat to high, and then add the beef with marinade. DON’T OVERCROWD the pan, and cook in small batches if needed. Cook the beef for about 2 minutes, turning pieces to cook all sides. Then add brown sugar, water (or beef broth) and green onion and sauté for 1-2 minutes (taste-test the sauce and add more sugar or soy sauce according to your own preference). At this point, the sauce should be thick enough to coat the beef. Remove from the skillet and serve over rice! Skillet: A large 12-14 inch skillet either in cast iron or nonstick. Avoid stainless steel which is more likely to stick. Soy Sauce: You can use low sodium soy sauce if you’d like to lower your salt intake. I used Kikkoman. San-J Low Sodium is also a good brand and has no preservatives. 365 is a budget-friendly option that’s organic too. 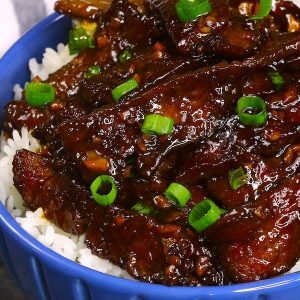 This Mongolian Beef has tender and juicy strips of beef smothered in an addictive sticky, slightly sweet and savory ginger garlic sauce. Make this popular P.F Chang’s menu item at home in just 20 minutes! Slice the beef against the grain into 2-inch strips that are ¼ inch thick. In a medium bowl, whisk together soy sauce and cornstarch. Add in the beef and marinate for 10 to 30 minutes. Place your skillet on medium-high heat, add the oil and fry the minced ginger and garlic for about 1 minute or until fragrant in a large frying pan. Turn the heat to high, and then add the beef with marinade. Don't overcrowd the pan, and cook in small batches if needed. Cook the beef for about 2 minutes, turning pieces to cook all sides. Then add brown sugar, beef broth (or water) and green onions and sauté for 1-2 minutes (taste-test the sauce and add more sugar or soy sauce according to your own preference). At this point, the sauce should be thick enough to coat the beef. Chicken can also be used – Mongolian Chicken is a delicious dish that many people like. Use low-sodium soy sauce if you’d like to reduce your salt intake. Kikkoman is my favorite brand. In case you find your sauce is not thick enough when your beef is ready, you can take the beef out, and add more cornstarch and cold water mixture (1:1 ratio) to the sauce. When the sauce is thick, add back the beef to coat evenly. 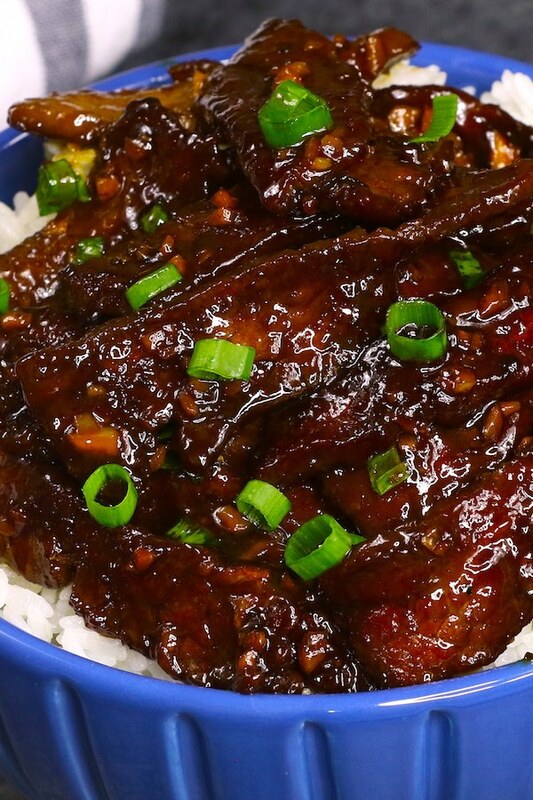 I love to serve the Mongolian Beef over steamed rice. It’s great with noodles, and you can also pair it with fresh vegetables such as broccoli, snap peas, baby bok choy, asparagus, and bell peppers, etc. Add chili flakes if you like the spicy flavor. Both light and dark brown sugar work for this recipe, and the latter has a more intense flavor. Use a large skillet or work for this recipe. Mongolian Beef （蒙古牛肉）is one of the most popular menu items at PF Chang’s restaurant. It’s a Chinese-American beef stir-fry made with sliced beef and scallions in a savory brown sauce and often served with rice or noodles. Serve with brown rice or another whole grain. You can also serve with lettuce wraps. I made this recipe some time ago, and it is smackdown delicious,. Easy Breezey and very tasty! I cut up fresh veggies ( peppers, brocolli, pea pods )and toss in last 2 minutes. Truly BETTER than any restaurant and Sooooo fresh! This dish is absolutely amazing! The beef is so flavorful and tender. I can’t believe more people haven’t left reviews! This rivals anything I could order at a restaurant, and it was so eaay to make! It’s definitely going to be on regular rotation in my home.